By Mark - Argentina - 14 Nov/02 - Viewed 2340 times. We are staying in Mendoza in the Savigliano Hostel. It costs A$30.00 pesos for a double room. We booked by telephone before leaving Bariloche as the private rooms are always booked up. It is right next to the bus station, so not far to walk with our bags. Mendoza is a big city, but all the streets are lined with trees and there are many parks. It is also the cheapest place we have been, eating out is half the price of Bariloche. For example, two evening meals including a large orange juice and a litre of beer cost only A$9.10 in Los Tres Mosqueteros next to the hostel. The first full day we were here we got the bus to Puente del Inca near the border with Chile. This town is named after a natural bridge that is formed by the mineral deposits from hot springs. We caught the Expresso Uspallata bus at 6.00am for A$20.00 return; there are tours but they are more expensive and go to other places too so do not stay long at the bridge. We soon found that the Expresso Uspallata was anything but express; once it got to Uspallata it became a local bus, driving round several times taking children to school and people to work. After Uspallata the road climbs up to the pass over the Andes to Chile. Along the way there are the most amazing multicoloured mountains in red, yellow and green. Puente del Inca is at 2720m above sea level, and some of the peaks nearby are over 6000m. We got to Puente del Inca about 10am. It is a small town of about 30 houses on one side of a river. On the other side are some ruined buildings and a nice church. The only bridge over the river is a natural one formed from the mineral deposits from the hot springs here. The span is 19m high, 20m across and wide enough to drive a car across. It is very impressive; it seems to be almost organic the way the multicoloured rock has grown across. Below the bridge are some abandoned baths. The rock has partly grown over them too. 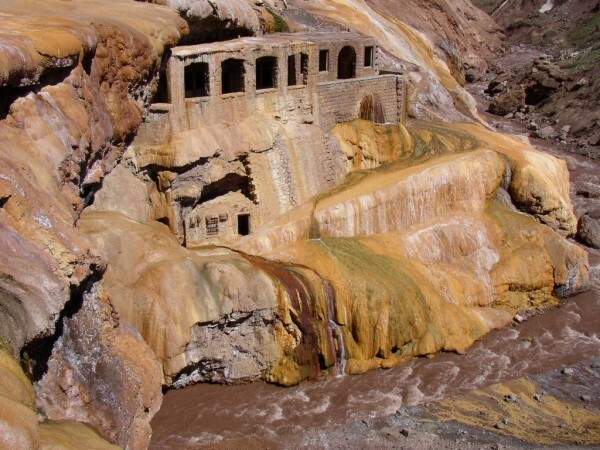 The baths are abandoned, but you can use them as the natural hot springs still feed them. Amazingly no-one is making any money from the bridge or the baths, both of which are free. First of all we walked around and looked at the church, then we paddled in a natural spring between the church and the bridge. We were practically the only people there. Next we went to look in the baths under the bridge. There were some very fat local men using them. After a while, tour buses started to turn up but none of them stayed very long. We found an empty bath and got in the lovely warm water for a while. The bus back left at 4.40pm so we waited for a while in a cafe. The next day we got up late and we for a walk in Mendoza's biggest park. We had heard there was actually a mountain in it, so we walked for an hour to the west side to be disappointed by a moderately sized hill. Our last day in Mendoza we hired bikes from the hostel (A$15.00 each) and cycled to a couple of bodegas (where they make wine). With the help from a map from the tourist office we stopped first at Bodega Conde. They seemed suprised to have visitors, but took us down to a cellar to try some wine. They didn't really show us round so we bought a small bottle of wine (A$4.00) and headed to the next one. This bodega was called La Rural and they were much more geared up to have visitors. An english speaking guide took us round on our own, showing us how the wine used to be made and how it is made now. It was very interesting. Then he took us to the tasting room to try some. It was a lot of attention for free, so we bought another small bottle here (A$5.00) to thank them for their time although you don't have to and it is half the price in the supermarket. Next comes a bit of a nightmare journey. We want to be in Santa Cruz, Bolivia in three days to meet up with a friend, so we are taking the overnight bus to Pocitos on the border (24hours, A$59.00). It arrives at 8am, so we are hoping to cross the border that day and get on the 5pm overnight train to Santa Cruz. A month ago we could have flown from Cordoba to Santa Cruz for A$205.00, but the airlines have started charging foreigners in dollars instead of pesos, so it is now too expensive. We would like to have seen the north of Argentina, but we have already spent six weeks here and had only planned for four so it is time to move on.